Pick Your Perfect Boise Home! If you are looking for a new home in Boise, Idaho, you may become overwhelmed with how many different types of houses there are in the area, including apartments, condos, Tudors, Ranches, and much more. However, only a few of the home styles can be said to be some of the best in and around the Boise area. Want some options to look into to make things a little easier on your end? Keep reading the following article to find out the top five home styles in Boise! You’re sure to be interested in some (if not all) of these five home styles! If you have ever dreamed of living in the mountains of Idaho, these types of homes are the choice for you! Experience the beauty of the Treasure Valley and feel the peace and relaxation that come with living pretty much in the middle of nowhere. Many of the ranch homes are on the outskirts of Boise, but they are still considered one of the best home styles in the area (since Boise is only a few minutes away). Great for those who enjoy the outdoors, these homes have plenty of space for you to ride your horses, go hiking, or even fishing if the home is near a lake! Many ranch style homes that are for sale currently are on about 2-3 acres of land and are big enough to house multiple people. Those that are inside Boise are usually one-level homes in suburban areas, but still have plenty of space on the inside. Space inside and out makes these homes the perfect place to find solitude away from the hustle and bustle of the city! Much of the homes in this style feature artisan handiwork. In other words, these buildings are simply beautiful. A lot of emphasis is put into the woodwork and into the stones, which makes these homes have a more rustic feel to them. 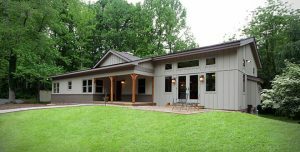 They have low ceilings, hanging eaves, and wide porches (which are typically made of stone). They can also have a few layers of bricks placed near the bottom or to define the chimney. 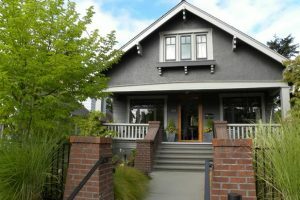 These homes are probably in the most demand right now (a recent survey from Trulia, a real estate site, showed that craftsman-style homes were liked by 43% of people who took the survey with ranch style coming in a close second with 41%), so it may be hard to get one, especially since they aren’t very cheap. If you want one of these homes, be prepared for high prices, yet high-quality architecture and comfort. These homes became very popular in the late 1800’s because they reflected both patriotism and the simpler things in life. 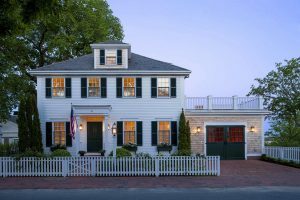 Typically, a colonial-style home will feature square, evenly-spaced, and multi-paned windows with shutters varying in color. The front door is also usually in the very center of the house. Most of the time, the house will be rectangular, about two stories high, and contain a fireplace in the front room. The downstairs area is mainly the living rooms, while only the bedrooms are on the top floor. They may seem plain by the description; however, these types of homes were also rated the third-best homes on the same survey taken by Trulia with 36% of people liking them. If you are interested in more of a simple home, one that is most likely in a small neighborhood in Boise, this style is the one for you. 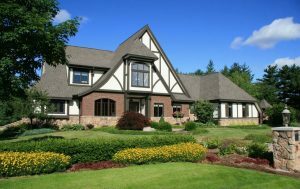 These homes most often are recognized by their wooden beams, arched doors, stucco walls, and high-pitched roofs. They were more common in the 1800’s to the early 1900’s; however, in recent years, these homes have been making a comeback into the modern world. Because of this, a lot of the Tudor homes in Boise are a bit more modernized. For example, many of the homes have gas-lit fireplaces and an all-house sound system. Much of the Tudor homes are also placed in the older part of Boise (aka the North End and Downtown Boise areas), so if you want to be closer to the historical part of town, this is the home style for you. Not sure which end of town is right for you? Click here to find out! Both elegant and ancient, these tudor homes will take you back in time to the colonial age, as well as give you a taste of the modern age. “What in the world is a kit home?”, you might be asking yourself. Back in the early 1900’s, many people decided to buy their homes out of a mail-order catalog. Some of the best-known kit homes were from the Sears catalog. These kits were actually shipped to the homeowners by boxcar and contained at least 10,000 to 30,000 pieces (depending on what they ordered). Each of these kits came with a 75-page instruction manual on how to put the home together. Blueprints would also be drawn with the homebuilder in mind so that each of the numbers on the pieces would have a specific place. 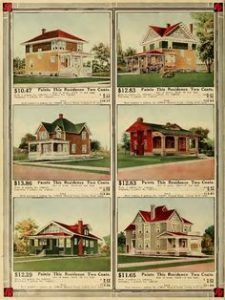 Altogether, the Sears catalog sold over 75,000 kit homes, all between 1908 and 1940. Even though this is something that will take a lot of time (since you will most likely be doing this by yourself), it is probably one of the best ways to get the house of your dreams. Click here to read more about whether resale or new construction is right for you! There are plenty of other home styles in Boise, Idaho, but it is certain that with the styles mentioned in this list, you will have the most relaxed and spacious home to fit your needs. If you aren’t interested in any of the homes for sale, but still want one of these kinds of homes, you can also have a home builder customize one for you on a lot of land of your choosing. Click here if you’re thinking about purchasing a townhome or duplex and want to know what the difference is! No matter which option you choose, Accel is here to help you have a pleasant experience in finding your new home. Happy house hunting!